Kayla Itsines is the Australian workout guru who shot to fame through her daily Instagram posts. Having become a fully fledged member of the fitness pack in recent years, Kayla launched her own website to bring you workout plans and nutrition tips. In this article taken from KaylaItsines.com Kayla advises how to construct the perfect salad. With temperatures hotting up this Easter weekend you can enjoy alfresco! Salads are an easy, tasty way to add vital nutrients to your diet. They’re so versatile and quick to make, plus they are an awesome addition to your meal prepping routine. If you’re hosting a family dinner or get together with friends, putting a little extra effort into your salads can make them a real crowd pleaser! Another benefit of regularly incorporating salads into your eating plan? You have the chance to take advantage of in-season fruits and veggies and you might find it’s really easy to eat healthy, even on a tight budget. So, want to know how to build the BEST salad? Follow the steps below! If you can, try to stick to leafy, dark greens, such as spinach, rocket, watercress or kale, rather than iceberg or cos lettuce varieties. Choosing darker greens can maximise your intake of nutrients, such as vitamins A, C and K and more. Adding these to your salad mix means you are well on your way to meeting your daily recommended intake for these nutrients. As a source of carbohydrates, adding grains to your salad can give your energy supply a little boost. We all know what it’s like to eat a delicious fresh salad and then feel like snacking a few hours later! Adding a healthier grain option, such as couscous or quinoa, provides your body with fibre, which can be filling, as well as a number key nutrients. Grains also add an earthy flavour that balances tangy dressings. There is no such thing as a right or wrong combination when selecting vegetables for your salad! I suggest using both cooked or raw vegetables to test out the textures and flavours you like best. Some great vegetable combinations to try are tomato, onion and mushroom or carrot, cucumber and capsicum. You can also play around with preparation techniques (such as dicing, chopping, Julienne or grating) if you’re feeling creative! To add extra colour, look for different varieties of your regular salad ingredients, such as yellow tomatoes or purple carrots. 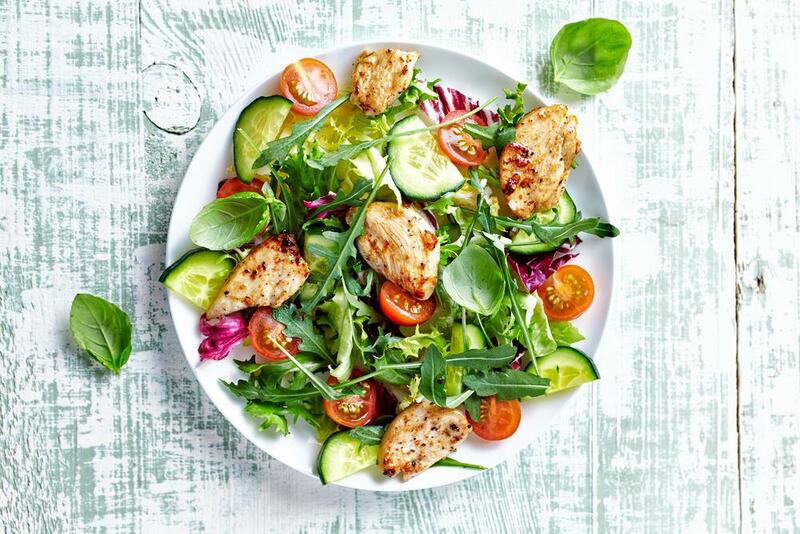 Adding grilled chicken to your salad is a simple and flexible way to get your protein fix, which can help you feel fuller for longer. Some other great protein options are grilled salmon or tofu. Salmon is a great source of Omega 3, which helps your body to fight inflammation and promotes healthy skin. If you eat salads regularly, you can mix up the flavours of your protein source by using different herbs and spices. You’ll be surprised at how much of a difference this can make! When it comes to salad dressings, I always think that fresh is best! I’d much rather make my own salad dressing rather than relying on store-bought ones that often contain preservatives or artificial flavours. I recommend using fresh ingredients or healthy oils in the salad dressing instead. Try to pick a dressing that doesn’t detract from the vegetables, but complements them. A tasty vinaigrette is always a great addition. For an easy to make salad dressing that is much healthier than the store bought options, check out some of these homemade healthy salad dressings. Your body needs fat (the good ones!) to help regulate your moods and keep your blood sugar in check. Foods such as walnuts, chia seeds and flaxseeds contain Omega 3, which can also help to lower blood pressure as well. It’s really easy to incorporate healthy fats into your salad - just sprinkle over some chopped walnuts, toss some pepitas in for extra crunch or add some diced avocado, which is one of my favourites! Now that you’ve built the perfect salad, all that’s left to do is serve it up and enjoy! Read more of Kayla’s health and fitness tips at www.kaylaitsines.com or workout with Kayla below. As featured in Forbes, Fast Company, The Guardian, Cosmopolitan, Greatist, Life Hacker and Dr Axe, Jen Miller of JenReviews.com has the authority on all things Food, Fitness and Home. Here she shares with us one of her favourite appetizer recipes for family gatherings, Sweet Potato Fritters with Pomegranate Syrup & Feta. Growing up sweet potatoes were relegated to the Thanksgiving table, and often confused with the yam. Since then I’ve found a fondness for sweet potato as long as it was exclusively used in savory applications, no honey or brown sugar, please! That is until I found a way to pair them with spices that only plays with the idea of sweetness. Playing with food is fun, and one of the greatest of ways is to turn that food into a crispy fritter. The flavors used marry together while the hot oil infuses them into the chosen main ingredient; grated sweet potato in this case. Most would go with herbs or just a simple salt and pepper seasoning, but because I wanted that idea of sweet without the sugar I used cinnamon and nutmeg for sweet warm flavors, and coriander seed and cumin for fresh earthiness. The combination of which becomes something that creates a craving for one more bite and a pomegranate fruit seemed like an ideal pairing to these tastes. 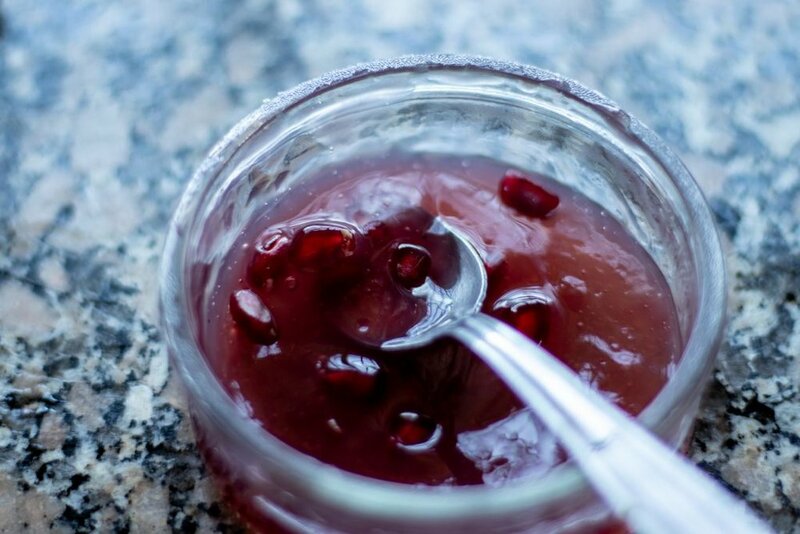 Turned to a thick sweet syrup, the pomegranate turns this nearly into a dessert, begging to have a sweet whipped cream or honeyed yogurt to go with it. A crumble of salty feta, on the other hand, brings the dish back to an appetizer or luxurious snack. But really, it could easily go the other way if one was so inclined! These sweet potato fritters are so versatile it’s hard to choose how to present them most deliciously! 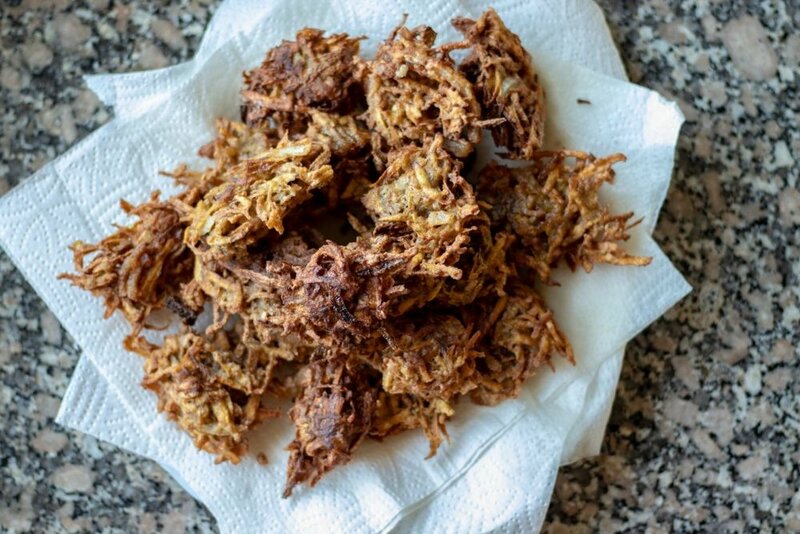 Notes: These fritters can be made ahead of time and frozen for a couple of months. Follow all of the steps up until serving, and instead freeze them. Pop them back into hot oil to fry after thawing when ready to use. Run cold water over the sweet potato to clean off any dirt or debris before peeling all of the outside skin and rinse again. Remove the peels from the onion and garlic cloves and cut off the root ends. Slice the onion thinly and then chop the slices into ½ -1 inch long pieces. Mince the garlic cloves and set them aside. 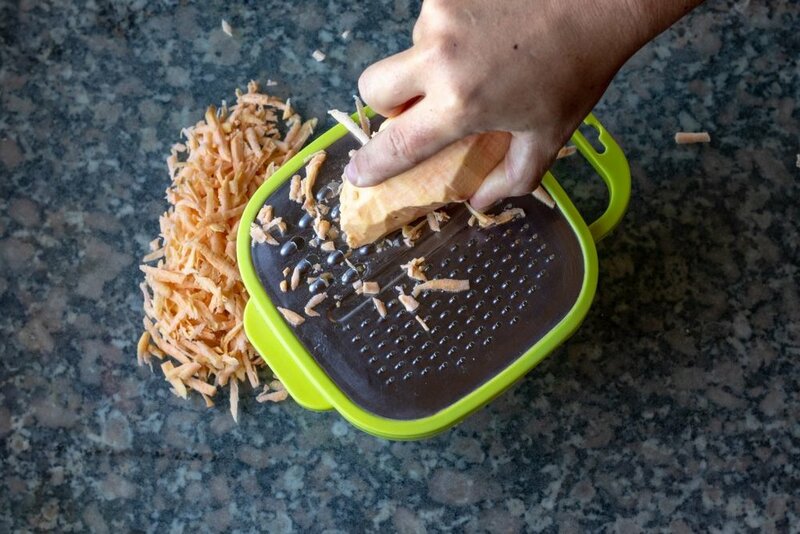 Grate the sweet potatoes on the large hole of a grater. 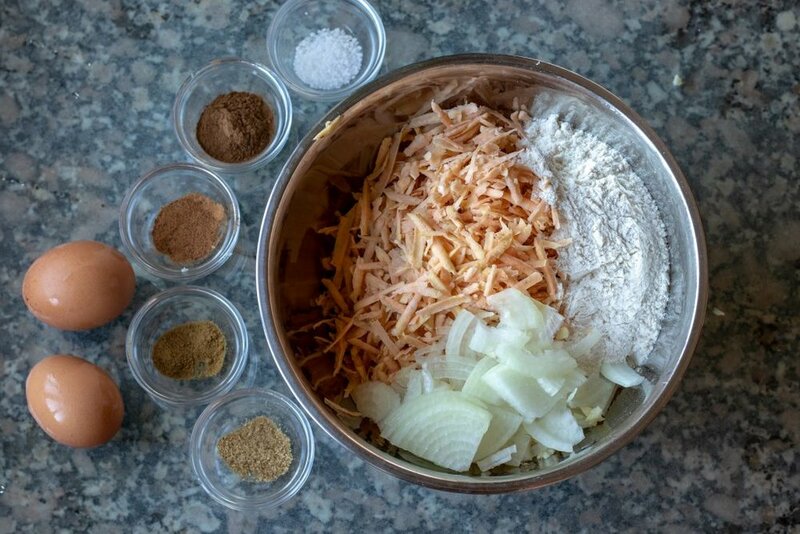 Place the sweet potatoes, onion, garlic, and flour into a bowl along with the cinnamon, nutmeg, coriander seed, cumin, and salt. 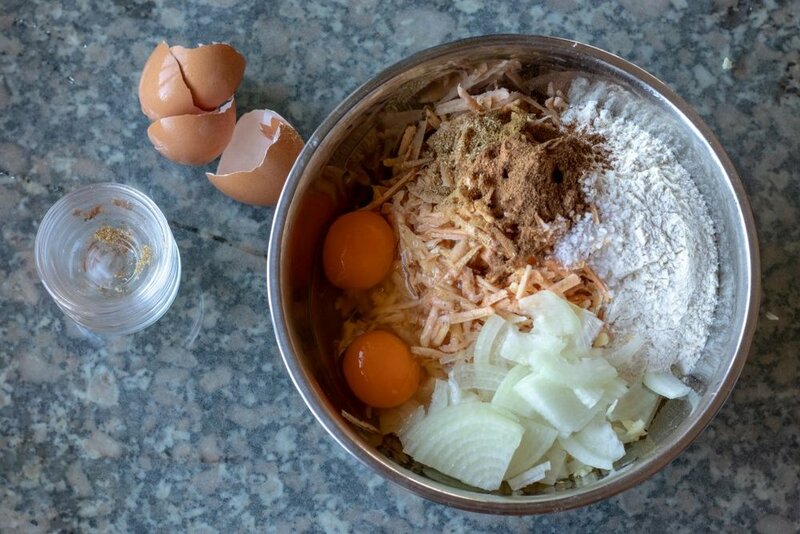 Crack the eggs into the bowl. Stir it together until it comes to a thick mixture and everything is evenly distributed throughout. Pour light cooking oil into a deep pan to about 1 to 1 ½ inches deep. Place the pan on a burner over medium-high heat and wait for the oil to reach about 350F, checking with a cooking thermometer. Alternatively, use a deep fryer, which has a temperature gage built in. If a thermometer isn’t available, drop a ½ inch cube of bread into the oil and if it turns golden brown in 30 seconds, it is hot enough. Scoop up a spoonful of the sweet potato mixture and transfer it back and forth between two spoons to form a loose, but sticky, ball. Drop the sweet potato ball into the hot oil and let it cook through; about 3 minutes on one side, turn and 2-3 on the other. 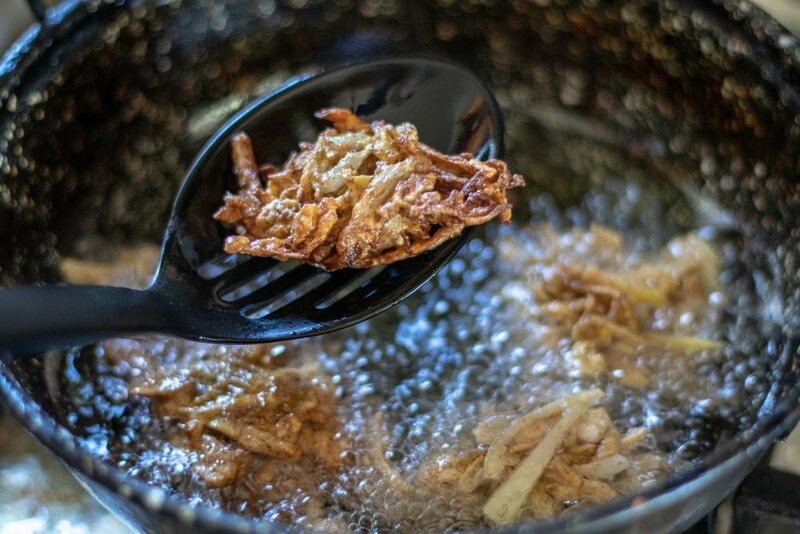 Transfer the finished fritter to a plate lined with paper towels and repeat with the rest of the fritters, cooking them in batches of 4-5 at a time. When the fritters are all cooked, sprinkle them with coarse salt and allow them to cool at least 5 minutes before serving. 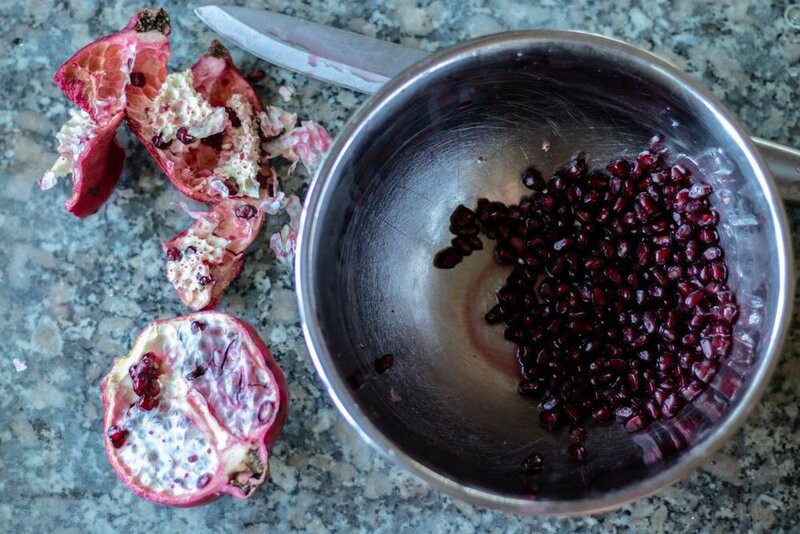 Cut the pomegranate in half with a chef’s knife. 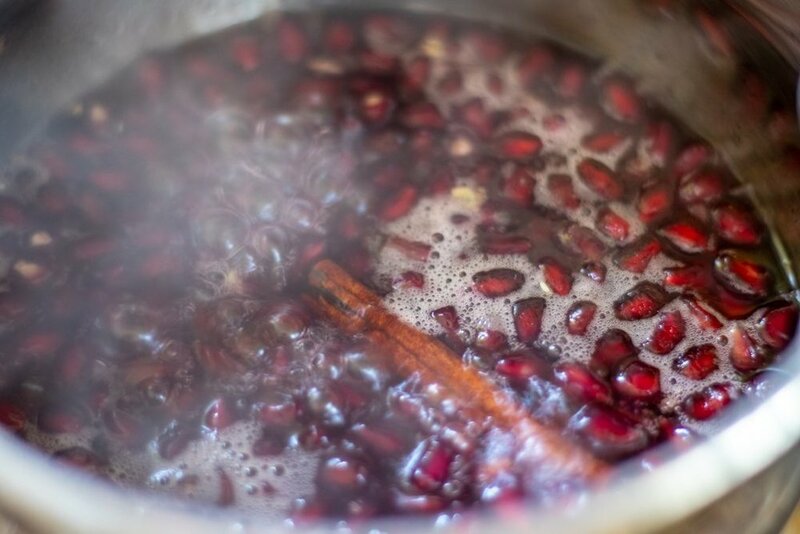 Remove the seeds from one half of the pomegranate and put them in a bowl as you work. Transfer the seeds to a small saucepan and add in the sugar, cinnamon stick, and water. Put the saucepan on the stove over high heat and bring it just to a boil. Turn the temperature down to medium-low and let it simmer about 10-15 minutes. It’s ready when the liquid has reduced by about half and the juices from the seeds have seeped out into the pan. Turn off the heat. Pull the cinnamon stick out of the pan and discard it. Stir the cornstarch into the mixture and let it thicken. 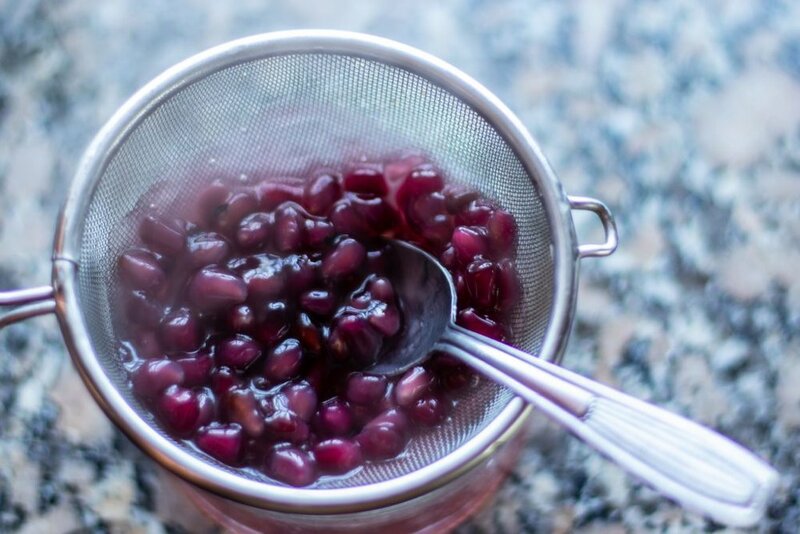 Strain the syrup through a mesh sieve and toss out the seeds. 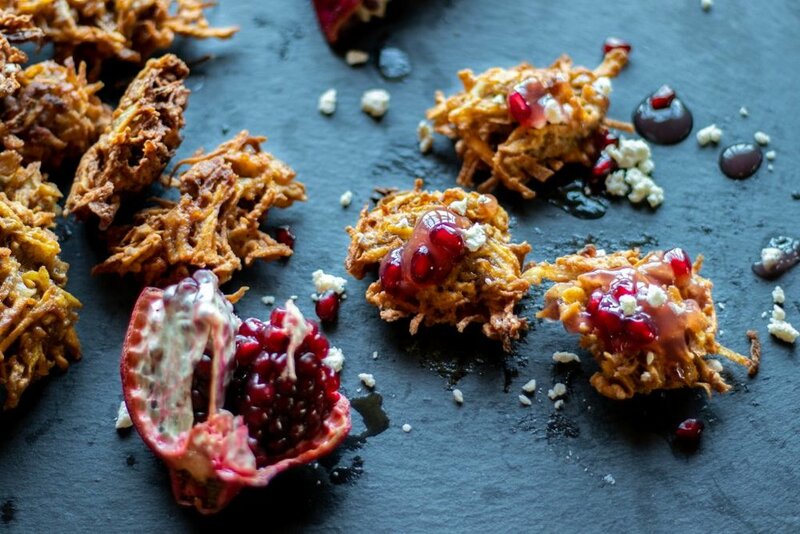 Serve the sweet potato fritters with the pomegranate syrup drizzled over them, a crumble of feta, and additional pomegranate seeds from the other half of the pomegranate on top. As I mentioned above, these fritters can easily be turned into dessert if the feta is left out and either a creamy honey goat cheese is substituted or whipped cream! 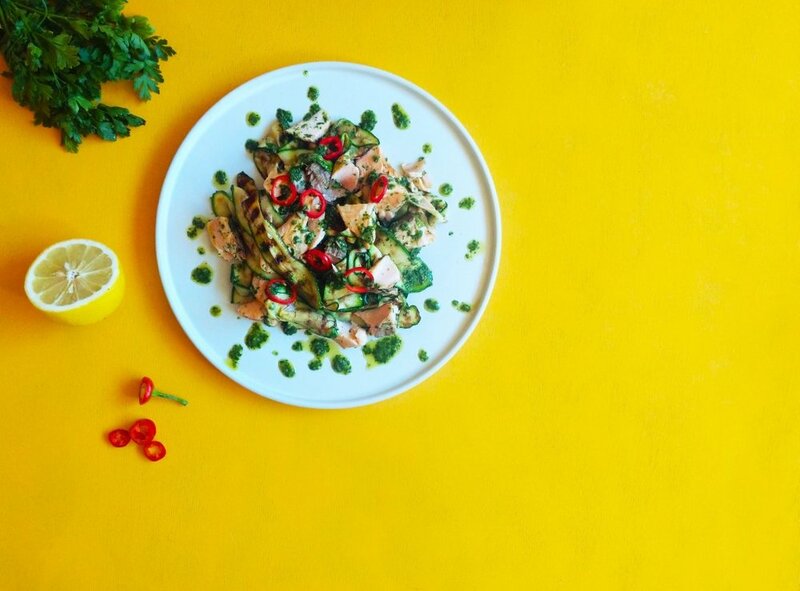 As the spring approaches we’re looking to ditch the stews and pies in favour of lighter, healthier dishes. Lets be honest the thought of bearing our carb loaded winter bodies right now is quite a scary prospect and so we’ve enlisted the help (basically begged!) of FYOUFODMAP’s Nikki Griffith who’s shared some of her bloat beating recipes. Charred Courgette & Salmon with her sauce. Courgettes can be a bit bland, so the cooking of them is mega important here. Don’t get impatient, you need to wait for the char. It’ll add depth and smokiness and will give you the perfect backdrop for the more punchy salmon. Guidance from Monash University says that up to 100g of courgette is low in FODMAPs. Anything higher and you’ll come up against high amounts of fructans. That means you can pretty much eat one courgette per person (by the time you’ve lost the end bits and a few scraps). The restrictions on size definitely put this into the ‘light’ dinner category so if you’re hungry, maybe add a potato salad on the side. Slice your courgettes lengthways (I use a mandolin for this on the second-to-thinnest setting). Heat some oil in a large griddle pan and cook your courgettes in a single layer until you see visible dark char lines, then flip them and repeat on the other side. You’ll need to do this in several batches but I promise, the time investment is worth it. If you put them all in at once then you run the risk of a mushy mess and none of the char flavour. Once all your courgettes are done, pop them in your oven to keep warm on the lowest heat setting. In a frying pan, heat some oil and then add your salmon fillets (the oil should hiss as you add them if hot enough). Cook them for 3 to 4 minutes on each side depending on how you like them to be done. I like mine still a bit blush in the middle so I do 3 minutes each side. Meanwhile, combine all the ingredients for the dressing in a food processor*. Once your salmon is ready, remove it from the pan and flake it into large chunks. Then carefully combine everything in a large bowl, making sure not to break the salmon up too much, and serve with some sliced red chilli on top. 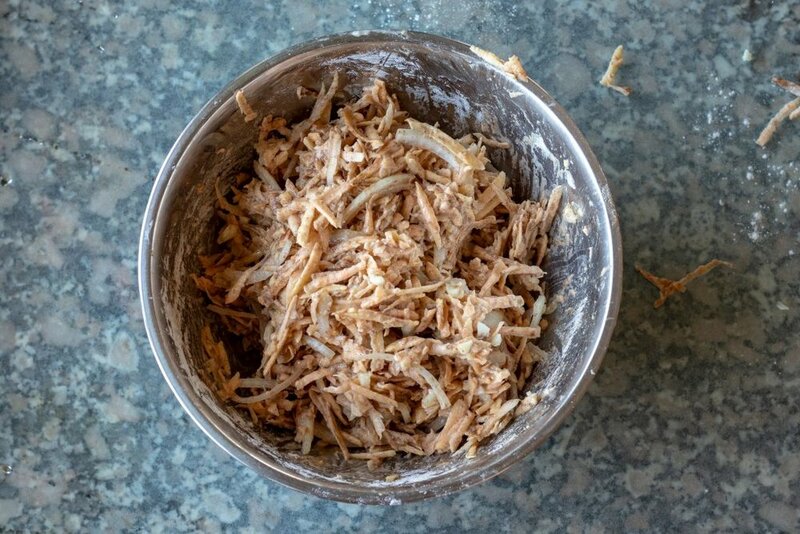 *If you don’t have a food processor, try finely (and I mean finely) chopping your herbs, mixing all the sauce ingredients together and pressing with a pestle. It won’t be quite the same but it’ll still be fresh and zingy. As mentioned, if you’re following a low FODMAP diet then you’ll need to stick to these amounts. If you’re not, you can add extra courgette for a more substantial serving. It’s a diet that’s been specially developed by the clever researchers at Monash University in Melbourne, to help relieve people suffering with IBS, which affects 1 in 7 people, from the associated symptoms. You can find a full list of foods you can and can’t eat on the Monash FODMAP app. The idea of the low FODMAP diet is to cut from your diet foods high in FODMAPs, for a period of 6 to 8 weeks. For some people with a gut-imbalance such as SIBO, they may be able to go back to eating as normal. Others will gradually re-introduce foods back into their diet, helping them to identify which are causing nasty symptoms. The humble sweet potato has gained much good press in recent years being preferred by many to its sister baking variety and so with its increasing popularity not looking to slow down any time soon we bring you LIVESTRONGS top 10 Easy Sweet Potato recipes to make sure this versatile staple stays at the top of your list. Just one cup of baked sweet potato, according to Cynthia Sass, RD, CSSD, NYC and LA-based performance nutritionist, provides nearly half of your daily vitamin C needs. And that same portion "also supplies 400% of your recommended daily intake of vitamin A. Both of which are vital for immune function, lung, eye and skin health," according to Sass. That's a pretty special spud, especially when you compare it to regular potatoes. To get the most out of your sweet potatoes, Sass recommends choosing organic ones (especially if you are eating the skin) and to look for sweet potatoes that are "firm with no cracks, soft spots or bruises." She also recommends to store them at room temperature and use within a week or two of purchasing. Does Baking Sweet Potato Make It Lose Nutrients? If you are a fan of baking your sweet potatoes, know that baking them, according to Sass, does diminish some nutrients, but she adds that "it certainly does not cancel them out." The best way to prepare your sweet potatoes and maximize their nutrient power? By steaming sweet potatoes in a basket over a pot of boiling water on the stove for twenty or so minutes or until soft. If you don't have a steaming basket, you can go ahead and boil them. According to NutritionFacts.org, "Sweet potatoes best retain their antioxidant power when boiled; antioxidants in both the peel and the flesh are greatly reduced when baked, compared to boiling or microwaving. The peel contains almost ten times the antioxidant power as the flesh and can be left on in many preparations." For our favorite sweet potato recipes, keep scrolling. 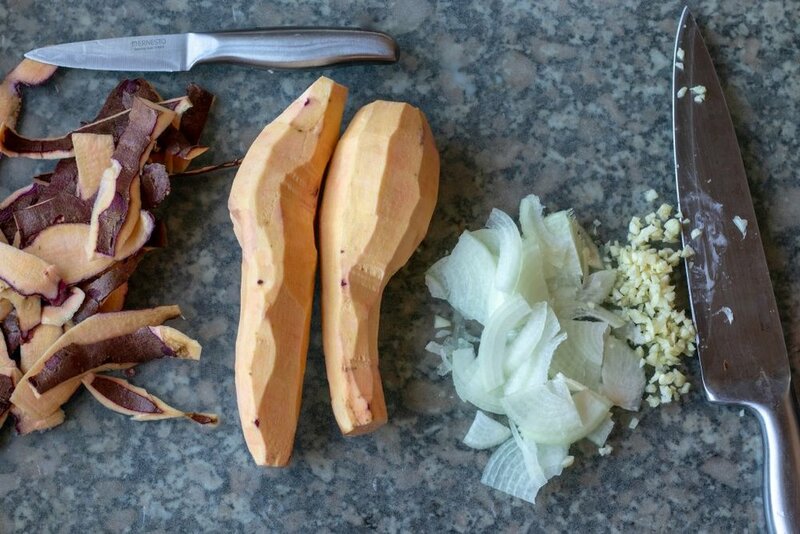 If you are wondering how to cook cubed sweet potatoes, you can sauté them like this recipe recommends, along with some onion, on a stovetop for 6 to 8 minutes. If you have more time though, you can bake sweet potato cubes in a 400-degree oven for 20-30 minutes — just drizzle them with a little olive oil and salt beforehand. We love the naturally sweet, caramelized flavors that emerge from sweet potatoes after baking them. In addition to the antioxidants in sweet potatoes that protect our skin and cells from damage, Sass says that one cup of sweet potato delivers "a third of your daily needs for manganese, a mineral that helps produce collagen and promotes skin and bone health." While the sweet potato may have seemed to explode in popularity recently, the reason more people are eating them is because more people are following gluten-free and grain-free diets. They've discovered that sweet potatoes provide a "nutrient-rich carb alternative," says Sass. 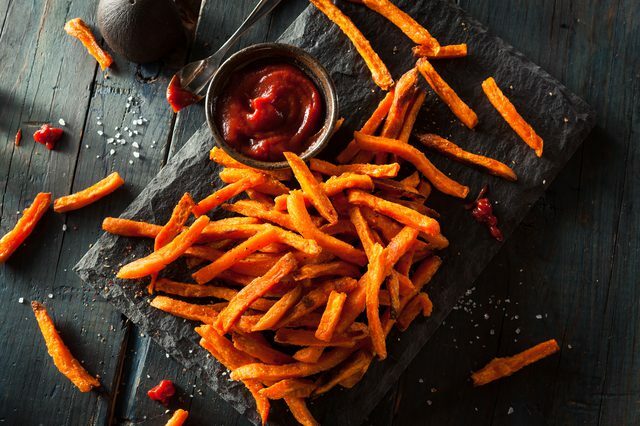 These "fries" hit the right note thanks to being baked, not fried. Just watch your portions: For most people, stick to a half of a cup of cooked sweet potatoes recommends Sass. Adding, "This should be combined with about two cups of non-starchy veggies, a portion of lean protein, and a source of healthy fat." So make sure this sweet potato recipe remains a side, rather than a meal. This recipe calls for tempeh, a plant-based protein made from fermented soybeans. Just one serving supplies your daily requirement of copper and more than your daily recommended intake of manganese. Both of these minerals, according to Medical News Today and the University of Oregon Linus Pauling Institute, are needed to support tissue repair while promoting cellular communication in the brain. Addition metabolic support comes from riboflavin and niacin, also found in tempeh. Because tempeh is a mild, nutty-flavored protein, the dish's flavor profile goes full spectrum, from sweet to spicy thanks to the sweet potatoes and the jalapeños. "One cup of sweet potatoes with the skin provides 950 milligrams of potassium. That’s more than twice the amount in a medium banana," says Sass. Why is potassium so important? "It supports heart function, muscle contractions, prevents muscle cramps, and helps maintain muscle mass," she says. In addition to delivering all the goodness of sweet potatoes, this recipe calls for low-fat versions of cheddar and cottage cheese which increases the calcium intake while reducing the amount of sodium and fat content. This sweet potato recipe, inspired by shepherd's pie, is a must-have winter comfort food, especially when it's dark, cold and rainy. This meal fits into Sass's recommendation to pair sweet potatoes with other food groups to create a healthy macronutrient balance. Add lean meat and plenty of vegetables to your meals to create a satisfying and balanced lunch or dinner. Another benefit of sweet potatoes? Sass says, "The fiber content of sweet potatoes makes them a slow-burning starch, meaning they provide even, sustained fuel, rather than an energy spike followed by a crash. Just one cup of baked sweet potato contains about six grams of fiber, which is more than a quarter of the daily recommended minimum." Sweet potatoes, according to the Library of Congress, come in a variety of colors. "The skin color can range from white to yellow, red, purple or brown," while their flesh can go from "white to yellow, orange, or orange-red." But don't confuse a sweet potato with a yam, or even a white potato at that. Yams are "starchier and drier" with 95 percent of them grown in Africa and most likely, even if something is labeled a "yam" at the grocery store, unless you are in an international food market, you are most likely still purchasing a variety of sweet potato. And sweet potatoes aren't even potatoes in the traditional sense reports Harvard T.H. Chan School of Public Health. They are root vegetables (so more like carrots, turnips and beets) rather than tubers like Jerusalem artichokes and jicama. Satisfy that sweet tooth in the morning with this moist, sweet potato-based cookie that won't wreck your diet. And while we don't recommend eating these for breakfast every day, you will get a beta-carotene boost first thing in the morning thanks to the orange-hued vegetable. Whole grains, oats and pecans — along with the fiber in the sweet potato — means a triple dose of fiber, which will help promote a healthy gut and aid in digestion. Fiber also helps reduce heart disease, reduce the risk for Type 2 diabetes and reduce inflammation of the intestine. This sweet potato hash can be prepped as a bigger batch ahead of time, saving you crucial meal-making minutes, especially when you're in a hurry. Store the spiced, baked sweet potato cubes in an airtight container all week and simply pull them out when you are ready to use them. Pop a serving of the sweet potato hash into a sauté pan and once warmed, add your favorite protein like tempeh (if you are keeping it vegetarian) or an egg. Add hemp seeds for an extra boost of omega-3 fatty acids that reduce inflammation, your risk of heart disease, lower cholesterol and blood pressure all while aiding in memory and cognition. "The pigment that gives purple sweet potatoes their gorgeous hue has particularly potent antioxidant properties," says Sass. And according the Harvard T.H. Chan School of Public Health, "sweet potatoes with purple flesh are richer in anthocyanins" than their orange-colored cousins. Anthocyanins are shown to play a role in preventing diseases while purple sweet potatoes have also been shown to help lower and regulate blood pressure according to a study published in the ACS' Journal of Agriculture and Food Chemistry led by Joe Vinson, a professor of chemistry at the University of Scranton. We can't think of a better way to incorporate this gorgeous root vegetable than combining it with protein and fiber-rich chickpeas that take your basic humus and turn it into something spectacular. Leftovers can be stored up to three days but we're pretty confident there won't be any left to store. If you are looking for a great way to jump-start the day, look no further than these breakfast nachos that feature sweet potato waffle fries as a base. Thanks to the slow-burning fiber of the sweet potatoes, you'll avoid that mid-morning energy crash. Building from there, add bacon, eggs, and black-beans for hunger-curbing protein. Slices of avocados, while tasty, provide a ton of health benefits. Medical News Today details that this green-colored fruit "supports skin health, enhances the absorption of fat-soluble vitamins, minerals and other nutrients, and may even help boost the immune system." Its the time of year where we've over indulged at Christmas and New Year and are feeling sluggish, toxic and just plain unhealthy. During the holiday period we tend to consume twice as much food as we normally would and give binge drinking a hall pass resulting in a battered liver and overstretched digestive system but fear not as help is at hand as Kelly Choi, editor of the 7 Day Flat Belly Tea Cleanse and Eat This Not That.com recommends her top 25 foods that will naturally revive your body and mind and get you feeling energised for the year ahead. "If you read about ancient torture methods, you’ll find some pretty gnarly stuff like something called “infusion,” in which a victim is bound and then force fed a list of repulsive substances like salt water, honey, vinegar and hot peppers. But wait! Isn’t that the Master Cleanse?" Truth is, you don’t need to kill yourself with a “detox” regime this New Year’s for rapid weight loss, or to cleanse your body of the damage you over the holidays. Good news is your liver and kidneys do a mighty fine job at the cleanse thing without juices, fasts, or strange concoctions. And there are a handful of foods—delicious ones—with impressive detoxifying and slimming properties, including tea, which I made the cornerstone of The 7-Day Flat-Belly Tea Cleanse, on which test panelists lost 10 pounds. So hold the vinegar and cayenne and give yourself and cleanse away the pounds, torture free, with my new plan—and the delicious foods below! Instead of overhauling your entire diet in an attempt to slim down for New Year’s, simply eat half a grapefruit before each meal. This tactic can help whittle your middle—by up to an inch—in just six-weeks according to a study published in the journal Metabolism. The scientists attribute the powerful effects to the grapefruit’s fat-zapping phytochemicals. But that’s not all! Another study conducted by Japanese researchers found that the scent of grapefruit can “turn on” calorie-burning brown fat cells, enhancing the breakdown of fat while reducing appetite. Sounds like a great reason to add it to your spring cleaning diet to us. The fruit can interact negatively with certain medications, though, so check in with your M.D before indulging in the citrus appetizer. In a world where there are so many myths, rumours and ideologies about food its hard to know what is fact and what is fiction. For example salt, in its tiny grain like format who would've thought something so simple could have such a huge impact on your health. Well considering the majority of people add salt to their foods on a daily basis and buy shop bought foods & take aways with added salt to them throughout their entire lives, you can see that over time thats a huge amount of salt passing through our wonderful bodies isnt it? But just like chocolate, red wine and fats, food is a lot tastier and dare I say it fun with that extra pinch of salt and so I say it's worth doing your research and adding good salt to your cooking whilst trying trying your best to avoid the bad. So what is Good Salt & Bad Salt? I would highly recommended the Celtic sea salt as a good salt. A good salt is damp & a dirty white grey colour. It is dried in a traditional way using the sun so all the marine microorganisms, enzymes, up to 70 minerals & trace elements remain in the salt and are not destroyed through drying. These minerals and trace elements are beneficial to our bodies as they help our immune system, the thyroid & adrenal function. Good salt also boosts the creation of digestive enzymes & juices that allow us to extract the vitamins & nutrients from the the foods we eat. Bad salt is processed, this is most shop bought table salts and added to processed foods. The salt is kiln dried. This salt lacks or has no trace minerals. The magnisium is lost due to over heating. The salt is heated above 1200 Fahrenheit and this denatures the salt. Its coloured with bleach to give it a white appearance. Now the salt is toxic and actually a poison to the body. Some bad salts even have ingredients added such as iodine, sodium, bi carbonate, fluoride and anti caking agents. All these can harm the thyroid & also lead to metabolism issues. These salts cause the blood pressure to rise because the blood is trying to remove & push out the toxins away from the heart. It also causes water retention. Remember these salts are added to takeaways, shop bought foods, tinned foods and more. This is why it's always good to make your own food, that way you are in complete control of all the ingredients going into you and your families bodies and can make responsible, informed choices about when you want to add that little extra sprinkle of salt, because lets face it we all want to enjoy delicious, tasty food but not at the risk of causing long term health issues. Edited by Natalie Anderson. Fresh from holding her first healing retreat in Bedale, North Yorkshire, Happi Food's Mariesa Martire shares some of her favourite vegan recipes to help you nurture your body from the inside out. For pre soaked nuts, soak cashew nuts over night or for a couple of hours will be ok in the day. Place all ingredients into a blender. A hand blender will work ok too. Whiz up all ingredients until a smooth creamy texture with no bits in is made. Cashew cheese is great as a dip or as a topping on your Raw pizza yum! Try it with roast peppers it's delicious. In another pan add coconut oil, onions, celery, potatoes and spring onions. Cover and leave to sweat on a low heat for 15 mins. Pour in your jug or blender the cashews, garlic, nutritional yeast lemon add 1/4 cup of water & pinch of salt and whizz up to make a creamy cashew cheese, set aside. Now remove the green stalks and bay leave from your medium pan. Add your cauliflower florets bring it all up to simmer for a further 20-25 mins until the cauliflower is tender. "My children were the source of my inspiration in creating Happi Foods. My girls were born with severe eczema and I cured them through food elimination cutting out all processed foods and only using natural ingredients. Through seeing how food was almost like magic in curing their skin, we made huge lifestyle changes over the years as a family. This led me to find new friends who were eating in a way referred to as raw. Raw foods are food that haven't been heated above 48 degrees centigrade which would normally destroy the enzymes and both 'good stuff'. I began to adding in raw foods to my children diet, making snacks, smoothies with lots of greens such as water cress and spinach. As time went on I started having so much fun creating amazing tasty dishes only using uncooked veggies, fruits, nuts and seeds with one of our favourite meals being the raw burritos which are delicious. I found the benefits of eating this way were incredible. I began to find younger people also commenting on my appearance saying “wow Mariesa you look amazing” “how do you have so much energy?” My energy indeed increased, I was waking up earlier with a clear mind and focus for the day. I lost excess weight, all my cravings for bad foods decreased, my skin was glowing and I began to feel in tune with my body and mind. It all started with small changes that led to a whole new lifestyle, this way there was no pressure it wasn’t like jumping into a faddy diet this was very different. I am so grateful to have found this way of living my girls and I are enjoying life to the full and now I want to share this with you."